1. A raccoon’s tail can be as much as 52% of their total body length. 2. A raccoon can fall as far as 35 to 40 feet without it affecting or hurting them. 3. Raccoons are very good swimmers. However, they do not like to get into the water because their fur is not waterproof. As a result, they absorb the water and it adds weight to their body, making it much more difficult to swim. 4. In the wild, raccoons can live for up to 16 years. However, the majority of young raccoons never make it past the age of 2 due to predation, trappers, disease and starvation. In captivity, some raccoons have been recorded as living to be 21 years old. 5. A litter of raccoons typically consists of four babies. Sometimes, a raccoon will give birth to between 3 and 7 babies, but more than 4 is rare. 6. Raccoons have a wide variety of noises they make to express emotion, including whistling, growling, hissing, whining and even purring. 7. President Coolidge once had a raccoon as a pet. He named it Rebecca. 8. Raccoons are not very picky about what they eat. However, they do prefer to eat creatures that are found in streams and rivers, such as crayfish, frogs, snails and clams. 9. The mating season for raccoons is between January and June. However, the peak time for mating is March and April. Female raccoons will only mate with one male raccoon for a season and they will avoid other male raccoons during that season. 10. The gestation period for raccoons is about 65 days, or just over two months. 11. A raccoon’s droppings can be fatal to humans because they sometimes carry harmful parasites. You should never touch droppings from a raccoon and if you do, wash your hands immediately. 12. 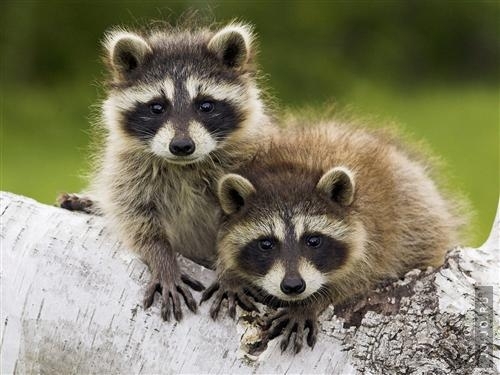 Raccoons are often referred to as “masked bandits” because of the mask-like markings that they have on their face. The mask-like markings help camouflage the raccoon from predators and it helps them have better vision in the dark. 13. Raccoons have an average weight between 12 and 20 pounds. 14. Although raccoons are native to North America, they have been introduced to other countries where they are often found today, including Japan and several countries in Europe. 15. Baby raccoons will begin to explore outside of their den about 6 to 9 weeks after they are born. This is also about the time that they will begin to eat solid foods. 16. Raccoons can carry and transmit the rabies virus through saliva. The main signs of a rabies infection include abnormal vocalizations, overly aggressive behavior, and impaired mobility. 17. A baby raccoon’s eyes will stay closed for about the first 3 weeks of life. 18. Raccoons have front paws that they can easily manipulate. This means that they can do everything from cause damage to property to something as intricate as opening a door latch. 19. Baby raccoons are often called kits and a group of raccoons is called a gaze or nursery. 20. As much as half of a raccoon’s body weight can be made up of fat. This helps it survive during the winter months when food is not as plentiful as it is during the warmer months. 21. Researchers have found that raccoons are very intelligent mammals. They have shown that they can remember task-solving skills for as long as 3 years. 22. In the early days of the United States, raccoon fur was so valuable that it was often used as currency. 23. On the ground, raccoons can reach speeds of 15 miles per hour. 24. Predators of raccoons include wolves, hawks, coyotes and owls. 25. Raccoons spend most of their active hours during the night because they are generally nocturnal animals. However, they do come out during the day sometimes.